Ruler of Syria 141-138 B.C. ; born at Kasiana near Apamea. Originally an officer in the army of Alexander Balas, he opposed the claims of Demetrius II., putting on the throne Antiochus, the young son of Alexander, who was still a minor, with the help of deserters from Demetrius. Diodatus took the city of Antioch; and Jonathan the Hasmonean was willing to throw in his lot with Antiochus. Diodatus, however, had other plans, and feared that Jonathan would stand in his way. He inveigled him from Bethshean to Ptolemais, and put him to death at Baskama or Baska (Josephus, "Ant." xiii. 6, § 6). From Ptolemais, Diodatus went to Judea against Simon Maccabeus, who had followed Jonathan as head of the Jewish forces. His real design now came to light; the young Antiochus was put to death, and Diodatus assumed "the crown of Asia." Simon turned to Demetrius for aid, and from him gained the independence of the Jewish state. Demetrius was taken prisoner in Persia; but his place was taken by another son of Demetrius I., Antiochus VII. (Sidetes), who marched against Trypho, and with the help of Simon shut him up in the city of Dora (Tantura, between Cæsarea and Carmel). 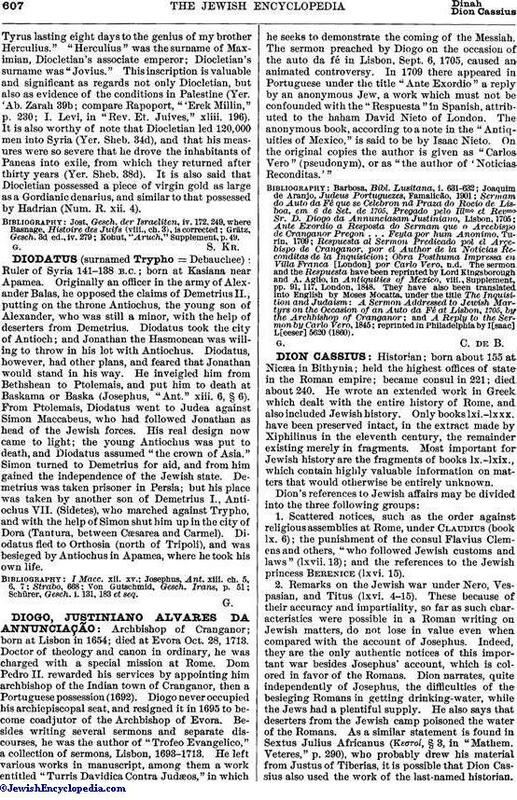 Diodatus fled to Orthosia (north of Tripoli), and was besieged by Antiochus in Apamea, where he took his own life. Schürer, Gesch. i. 131, 183 et seq.